Former 'Sesame Street' writer says Bert and Ernie are gay. The show says otherwise. 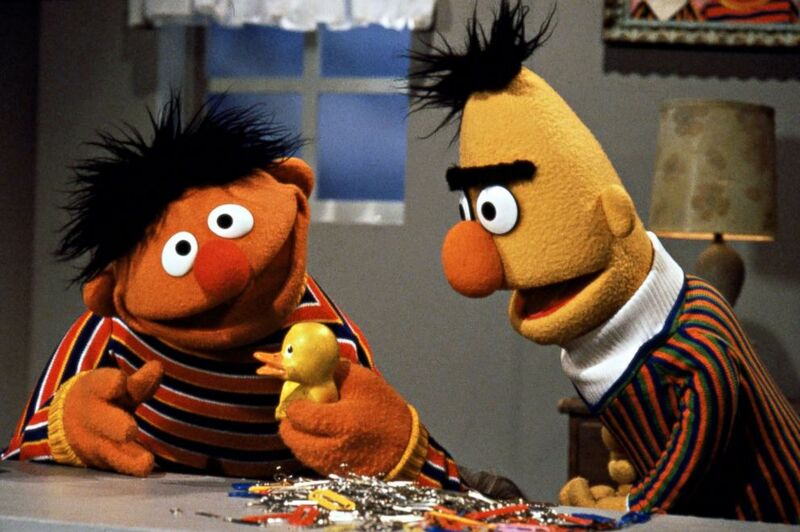 WATCH Former 'Sesame Street' writer says Bert and Ernie are gay. The show says otherwise. Following an interview given by a former "Sesame Street" writer who said he wrote the beloved characters Bert and Ernie as if they were gay, the show has said otherwise. "Sesame Street" on Tuesday tweeted, "As we have always said, Bert and Ernie are best friends. They were created to teach preschoolers that people can be good friends with those who are very different from themselves." Focusing specifically on their orientation, the statement continued, "Even though they are identified as male characters and possess many human traits and characteristics ... they remain puppets, and do not have a sexual orientation." The response from the show comes two days after Mark Saltzman, who is openly gay, spoke to Queerty about his own coming-out story, and the iconic duo came up. Saltzman was a writer on the show from 1985 to 1998. "I remember one time that a column from The San Francisco Chronicle, a preschooler in the city turned to mom and asked, 'Are Bert and Ernie lovers?' And that, coming from a preschooler was fun," he said. "And I always felt that without a huge agenda, when I was writing Bert and Ernie, they were. I didn't have any other way to contextualize them. The other thing was, more than one person referred to Arnie [his partner] and I as 'Bert and Ernie.'" When referencing "Arnie," the writer was talking about Arnold Glassman, his partner of 20 years before he died in 2003. Saltzman continued, "Yeah, I was Ernie. I look more Bert-ish. And Arnie as a film editor -- if you thought of Bert with a job in the world, wouldn't that be perfect? Bert with his paper clips and organization? And I was the jokester. So it was the Bert and Ernie relationship, and I was already with Arnie when I came to 'Sesame Street.' So I don't think I'd know how else to write them but as a loving couple." He admitted he never told the head writer he was writing the characters this way, adding, "there's not a Bert and Ernie float in the Pride Parade." And while a 2013 New Yorker cover suggested the pair were gay, the show released a similar statement at the time, once again saying puppets don't have a sexual orientation. Still, Saltzman added, "The New Yorker cover was kind of vindication."